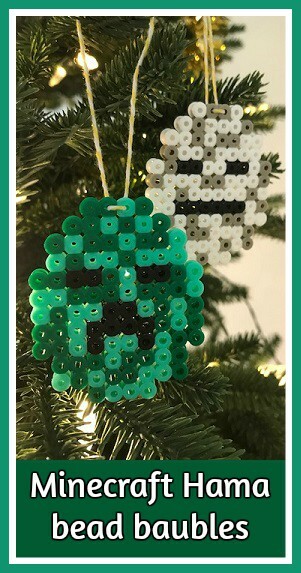 I love making Christmas decorations, and one way to persuade the children to do some crafting with me is if I can give it a Minecraft theme! So we sat down to make some Minecraft themed Hama bead baubles for the Christmas tree. These Hama bead baubles are made using the Hama bead large square pegboard (affiliate link). I do have several circular pegboards, but I thought that using the square board would be easier to make the blocky characters. I made six baubles - a Creeper, a Sheep, a Pig, Steve, an Enderman and a Skeleton. It's easy to make all different characters, I found that you just need to work out the best place to put the eyes and then you can work from there. Once ironed I used some coloured string to make a hanging loop for the bauble. 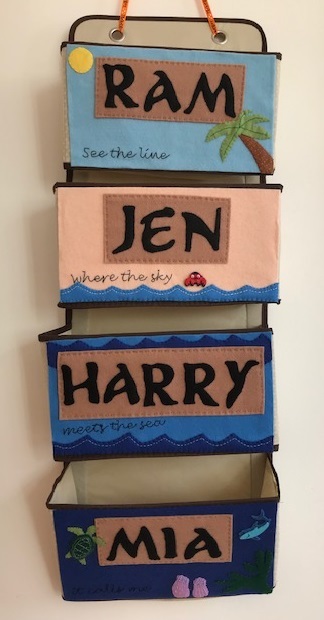 You should be able to use a needle to thread the string through a couple of the holes in the top of your design, and then they are ready to be hung on the tree! After Hama bead designs have been ironed I always place them underneath something heavy while they cool so that they remain flat. You can read some more ironing tips for Hama beads here. If you are looking for more Christmas crafts using Hama beads you can find my Christmas Hama bead crafts round up here. And if you enjoy crafting with Hama beads, you can find all my Hama bead crafts here.